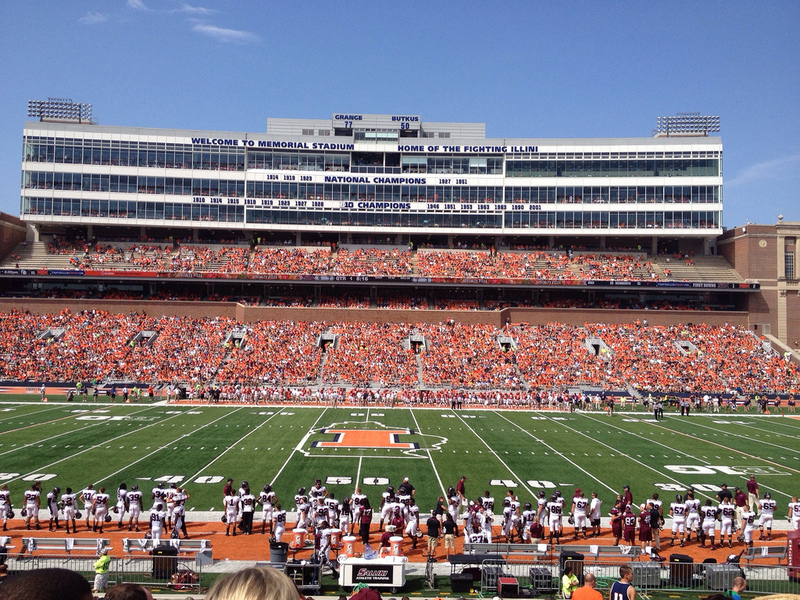 Located in Champaign, IL, Memorial Stadium has been the home of the Illinois Fighting Illini for nine decades. Prior to its opening in 1923, the Fighting Illini played at Illinois Field. This stadium became to small and by 1923 contributions of nearly $1.7 million were made to the University of Illinois in order to build a new stadium, to honor the men and women who fought during World War I, and later World War II. Named Memorial Stadium, it was completed by November 3, 1923 when Illinois beat Chicago. Throughout its nine decades of existence Memorial Stadium has underwent numerous improvement and additions. Today, the stadium has a capacity of 62,872 consisting of two tiers of bleachers. The lower level forms a horseshoe and upper decks are found on both sides of the field. The press box is located on top of the west side upper deck. A huge 125 feet wide by 54 feet tall, $6.7 million, HD video/scoreboard, installed before the 2013 season, is located at the west end of the stadium. Originally, Memorial Stadium had a grass field, but in 1974 the grass was replaced with Astroturf, and has since been replaced by Fieldturf. It was the home of the NFL’s Chicago Bears for one season in 2002 as Soldier Field was renovated. After the 2006 season work began on a $116 million expansion project. Completed by the 2008 season, this expansion and renovation project included the construction of a new press box and luxury suite area on the west side, 10,000 seats on the north side, connecting the south endzone to the east and west grandstands, renovating the concourses and moving the main video/scoreboard to the south endzone. In April 2011 the university announced that 2,200 seats would be removed from the south end of the stadium due to the age of the aluminum structure. This reduces the seating capacity to 60,600.